GRANITE FALLS, North Carolina -- A North Carolina woman hit the jackpot with two scratch-off lottery tickets, marking the second such instance in three weeks. 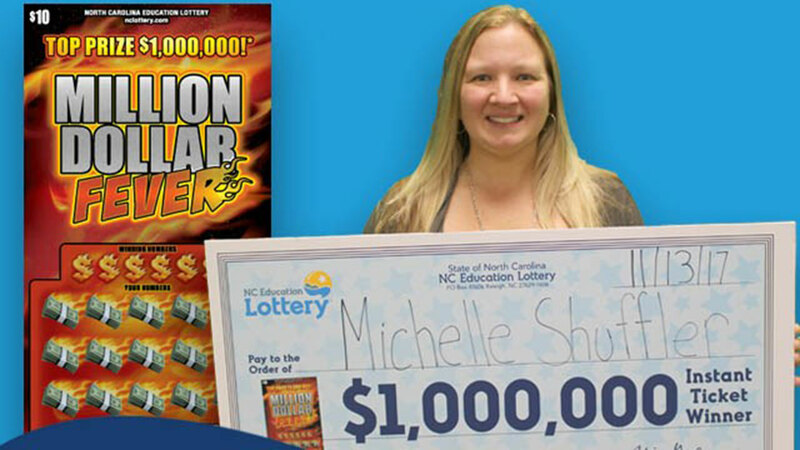 Michelle Shuffler, of Granite Falls, won $10,000 with one scratch-off ticket and $1 million with another on Sunday. Shuffler said in a statement that she and her husband purchased the winning $10,000 ticket in Lenoir. "We don't normally play the lottery," Shuffler said. "My husband just happened to have some cash in his pocket. At the last second, he decided to buy a ticket." When Shuffler scratched the Million Dollar Fever ticket, she saw that it was worth $10,000. "I was in complete disbelief," Shuffler said. "I still am." Feeling lucky later that night, they decided to get another scratch-off ticket 22 miles away in Granite Falls. "We saw that the game had a million dollar prize," Shuffler said. "So we decided, 'Why not try to beat the odds again?'" When she scratched the second Million Dollar Fever ticket, she realized she had in fact beat the odds and won $1 million. "It's quite astonishing," Shuffler said. "It's a miracle!" Shuffler claimed both prizes Monday afternoon at lottery headquarters in Raleigh. For the $1 million prize, she had the choice of taking an annuity that has 20 payments of $50,000 a year or a lump sum of $600,000. She chose the annuity. She received her first payment of $50,000. After required state and federal tax withholdings, she took home $34,753. She will get an additional payment each year for the next 19 years. Shuffler plans to use the money to save for retirement and add to her children's college funds. The $10 ticket launched in August with five top prizes of $1 million. Two top prizes remain. Kimberly Morris, of Wake Forest, also won the lottery twice at the end of October.